I’ll be one of the first to admit that I have accidentally hit an object or two in my garage. 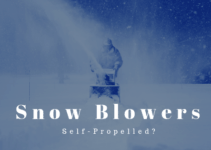 I’m confident that many people reading this article probably have too. It is super simple to misjudge your available parking space and run into objects if you are not careful. 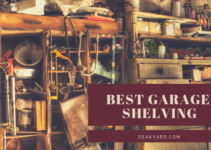 A solution to avoid accidentally driving into items such as garage shelving, lawn tools, or bikes is to purchase a garage parking sensor or aid. If you purchase one of these sensors, you will not have to worry about how far forward or how far back you park your car. Purchasing one of the best garage parking sensors will help you find that sweet spot where your car is parked perfectly day-after-day. There will be no more worries about running into the many items around most garages. The Maxsa Garage Laser Park mounts on the garage ceiling approximately above the front windshield of your car. Once the unit is mounted, you then park your car in the garage at your ideal parking location. You then climb on a ladder and adjust one of the dual lasers to hit a recognizable spot in your car. This spot might be a logo on interior dashboard, a knob, a dial, or whatever other spot you choose. Once the laser is set to an interior spot, you simply pull into your garage each time and line your car up until it reaches your designated recognizable spot. If you are a bit confused, watch the below video to see an excellent tutorial on how the laser is setup. You can see from the picture above that this Park-Daddy parking system comes with two infrared head units. You place the units across from each other on opposite walls to create an invisible infrared beam in-between the units. The RF radio receiver (the smallest item picture above) plugs into the cars cigarette lighter to power it up. 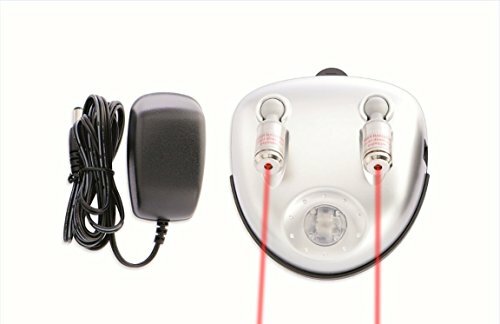 When your car is in the path of the infrared beam, the receiver will produce a red light and a continuous buzzing noise. Once the car is clear of the beam, a green light will display on the receiver to indicate the car is in the clear or ready to be parked. The units can be mounted with screws (included) or with peel off mounting tape that is on the back of each unit. The below video provides a demonstration on how easy it is to mount the units. Most people will have their parking system up and running within less than 10-15 minutes. The Park Zone Parking Aid might look like an old school telephone or modem but it does an excellent job at helping park your car in the same spot each time. The unit runs off of 4 AA batteries (sold separately), so there is no need to worry about plugging in the unit. You mount the sensor unit (left side unit in the above picture) at car bumper level on the wall in front of where the vehicle parks. Above the sensor unit, you mount the traffic light indicator where you can easily see it from the drivers seat. You then attach the telephone cord between the two units and the installation is complete. You will then park your vehicle in your desired garage location and then you will calibrate the unit. The Park Zone Parking Aid is then ready to go. The unit comes equipped with red, yellow, and green lights on the indicator. When you first start approaching the garage parking space a green light will be displayed. As you move closer to the unit the light will change from green to yellow to indicate you are nearing your calibrated parking spot. As you slowly move forward, the light will turn to red once you hit the parking location that you calibrated. The below video provides a nice overview on how the Park Zone Parking Aid is installed and used. You can see from the video why we think this is one of the best garage parking sensors for ease of installation. The technology used for this parking aid is as basic as it gets. It is essentially a ball with a face that hangs from a string that is attached to the garage ceiling. Once you find your ideal parking spot in the garage, you hang the ball to where it will just hit the windshield at the eye line of the driver. Each time you enter the garage, you slowly drive your vehicle until you reach the ball hanging at the driver’s eye level. It is a very cheap and simple concept but something that has worked for years. This parking aid is our pick for the best budget friendly parking aid. The Maxsa Park Right Parking Mat is placed on the garage floor in the location where the car is conveniently parked. 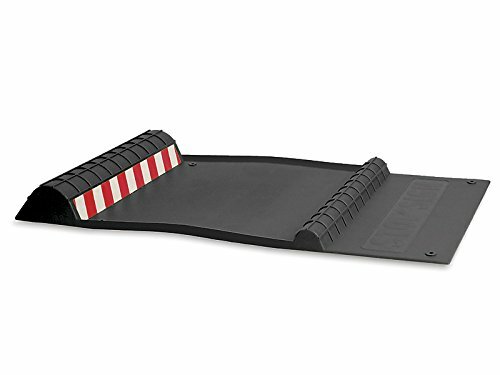 The mat is designed to fit one front tire between the two humps on the mat. The driver simply steers the vehicle until the front tire goes over the first hump. The driver then puts the car in park. That’s it! As long as the designated front tire is in-between the two humps, the car will be parked in the same location each time. The mat comes with ant-skid tape on the back of the mat to deter the mat from moving. See how it works in the video below. The easy to use Parking Target HD18 will have you parking in the same spot without any hassle. This parking aid is somewhat similar to the Maxsa Park Right directly above. You park the car perfectly in your garage and then you place the Parking Target against a tire. When you go to park your car, you slowly drive until your tire butts against the Parking Target you put in place. The manufacturer claims the product will outlast your car, so there is no need to worry about damage even with a heavy vehicle. The Park N Place is placed directly in front of the area where you wish to stop your vehicle. When you bump up against the flexible pole, a light will flash on the sign indicating you should stop the vehicle and park. Unlike some of the parking aids above, the Homebrite Park N Place can be moved around as needed. The unit runs on batteries so there are no wires to worry about getting in the way. This is an excellent choice if you have difficulty judging when to stop and you want a good visual to assist you. The Nordstrand parking assist is another quality sensor that uses a light system to help the driver park perfectly. 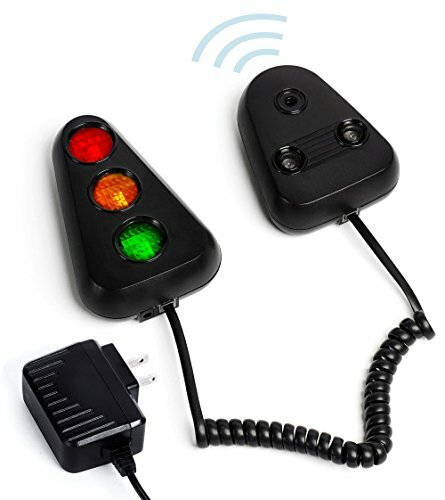 This product is similar to the Park Zone PZ-1600 above which uses a red, yellow, and green light system to guide the driver into their parking spot. When the light is green, the driver is approximately 10 feet away from the sensor. The light turns yellow (amber) at about 7 feet and produces a buzz. Once the driver is at the programmed parking spot, the light will change to red and produce a constant tone. The unit can be used by either plugging it in or by using AA batteries. This is one of the best garage parking sensors if you are looking for a more high-tech option compared to other models. Do I really need a garage parking sensor? If you have had no issues with running into objects in your garage, the answer is no. However, even if you have had no issues, it is a nice preventive tool to have to avoid a possible accident. 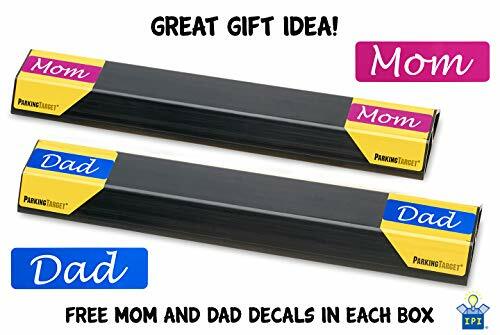 What type of garage parking aids are available? 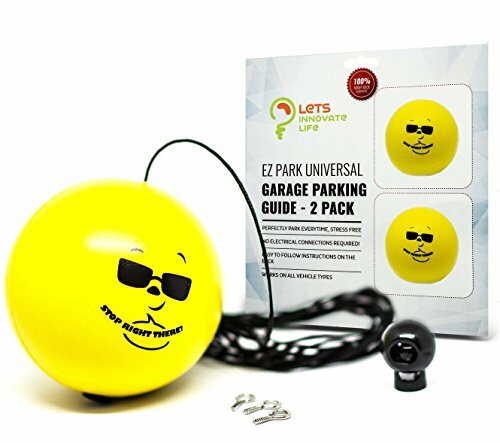 The basic parking aids are tennis balls or similar products that hang from the ceiling and provide a reference point of where you should park. Other more sophisticated products include sensors that light up and/or make noise as you approach your calibrated parking spot. There are also parking aids that you drive at least one tire into to confirm you have reach your designated parking area. We have provide a nice variety above, which should provide an idea of the products available. Do garage parking sensors work? 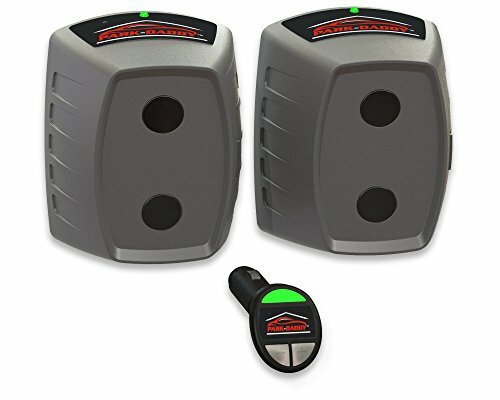 If you select one of the best garage parking sensors, we are confident you will have a product that will likely last and perform effectively for some time. A good idea is to check the review to read actual product user’s experience with the parking aids. 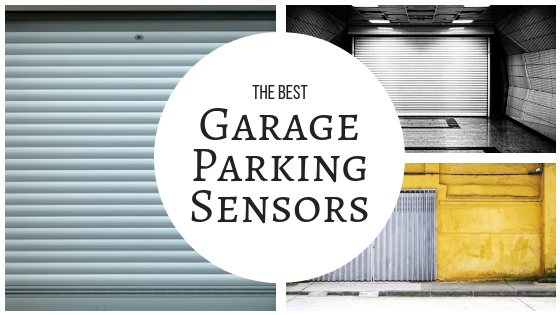 What are the benefits of a garage parking sensor? The main benefit is that you avoid running into something of value. A sensor provides an extra layer of protection to help ensure that the driver does not accidentally cause damage. This could ultimately save a lot of money down the road. 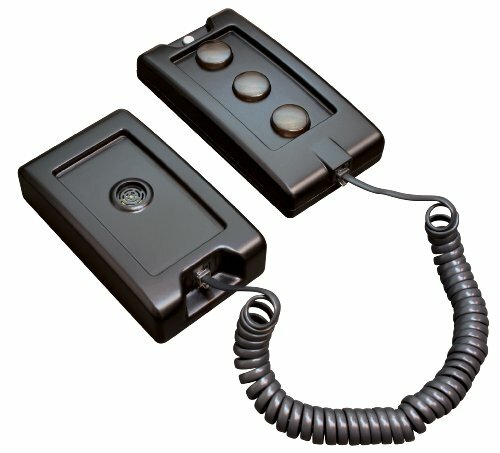 What is the best garage parking sensor out there? We provided our picks for the best garage parking sensors above. We purposely provided a variety of products to meet the various needs of our readers. We believe that most readers will be able to purchase a quality sensor from our selection above. We hope that you were able to find a one of the best garage parking sensors for your needs from our above selections. 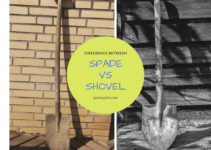 While this is not the type of product that most people would want to spend their money on, a parking aid may be highly beneficial down the road to prevent potential property damage or the to eliminate bad parking jobs that hinder movement around the garage.